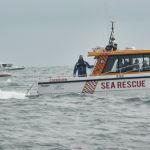 On Saturday 10th Feb the State Minister for Emergency Services, (Hon Fran Logan) accompanied by the Commissioner of the Department of Fire and Emergency Services, (Mr Darren Klemm) visited the three major sea rescue groups in the Perth area. The minister started off with a visit to Cockburn Volunteer Sea Rescue. Then he moved on to inspect the facilities at Fremantle Volunteer Sea Rescue before taking a trip up the coast on board Fremantles’ R100 to rendezvous with Whitfords Volunteer Sea Rescue vessels Green 1 and Green 2 for the final stage of the trip to Ocean Reef. The minister met members of the Whitfords committee and took a tour of the radio tower and other facilities. He was then shown Green 3 on its trailer in the big shed. After getting first-hand experience of R100 and then Green 1 and Green2, the minister was able to see immediately the potential shortcomings of Green 3 for some of the conditions we experience doing rescue duty in local waters. Following a pleasant lunch provided by DFES, the Minister and the Commissioner both had some encouraging and complimentary comments to make about Whitfords and the other sea rescue groups in the state. 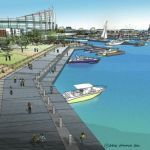 Of particular interest to Whitfords members, the Minister gave assurances that the government will ensure that we will be provided with appropriate accommodation during the building of the Ocean Reef Marina and a new, purpose-built facility as part of the completed new marina complex.